Home » Liver » What causes liver pain after drinking? If you are one of the many Americans who enjoy having a drink or two, experiencing liver pain after drinking may alarm you. Your liver is a vital organ responsible for breaking down the nutrients you consume and turning them into energy, as well as detoxifying your body, but when it becomes damaged, you often don’t realize it until the damage is severe. What does alcohol do to the liver? Your liver is responsible for processing the alcohol that enters your system, and is only able to handle a small amount at a time. When you drink, the alcohol is absorbed through the stomach and small intestine into the bloodstream. This blood is filtered through the liver first before travelling to the other parts of the body. Once in the liver, alcohol produces an enzyme called acetaldehyde that can damage liver cells and cause permanent scarring. How long does it take to have liver damage from alcohol? Liver damage develops in stages, beginning with steatosis. Steatosis is the term for having a fatty liver, a condition that occurs in nearly everyone who drinks heavily. It is the earliest stage of liver disease and occurs when fat accumulates in the liver cells. This damage is reversible once alcohol consumption has stopped. The second stage is called alcoholic hepatitis, and occurs if heavy drinking continues after the development of steatosis. Mild alcoholic hepatitis causes the liver to become inflamed, resulting in progressive liver damage that can last for years before turning into cirrhosis. Acute alcoholic hepatitis may cause liver failure and life-threatening complications to develop in a matter of days. Alcoholic hepatitis is also reversible with the cessation of drinking. The last stage is liver cirrhosis, in which healthy liver cells and tissue are replaced by scar tissue, inhibiting the liver’s ability to function correctly. Approximately 10 to 20 percent of heavy drinkers will develop liver cirrhosis after at least ten years, and this damage is irreversible. What are the problems of drinking too much alcohol? Drinking too much alcohol can lead to a variety of health issues such as serious liver problems and alcoholic liver disease, pancreatitis, depression and anxiety, impotence, high blood pressure, mouth, gullet, liver and breast cancer, obesity, addiction, nerve damage, and stomach disorders. Drinking heavily also increases your risk of accidents, as approximately one in every seven road deaths are related to alcohol. Approximately eight to 10 percent of Americans drink heavily, and 10 to 15 percent of these people will develop alcohol-related liver disease. Alcohol-related liver disease is the result of years of heavy drinking that causes damage to the liver and can eventually develop into cirrhosis. As outlined above, the stages of alcoholic liver disease are steatosis or fatty liver, mild and acute alcoholic hepatitis, and cirrhosis. The symptoms of fatty liver include occasional pain in the upper-right abdomen. When damage progresses into acute alcoholic hepatitis, symptoms include nausea, vomiting, fever, abdominal pain, and jaundice. Cirrhosis causes scarring on the liver and prevents the organ from functioning properly. It can cause complications such as esophageal bleeding, kidney failure, and even liver cancer. People who have a family history of alcohol-related liver disease, have poor nutrition, and drink heavily and/or binge drink are at a higher risk of developing alcohol-related liver disease. If you are experiencing liver pain after drinking, you should contact your doctor so they may diagnose the cause of the pain. To do so, your doctor may conduct a liver biopsy, blood test, and a study of your liver function to assess how severe your liver damage may be. You may also be encouraged to attend alcohol counselling programs to help you abstain from drinking, as well as prescribed vitamin A and B supplements to help your liver heal. In the case of severe cirrhosis, you may need a liver transplant as the scarring can be so extensive that your liver stops functioning effectively. Liver pain after drinking is a serious issue that could signal the presence of a fatty liver, alcoholic hepatitis, or liver cirrhosis. If you experience liver pain after drinking, contact your doctor so they can diagnose whether you have liver disease and which stage it is. 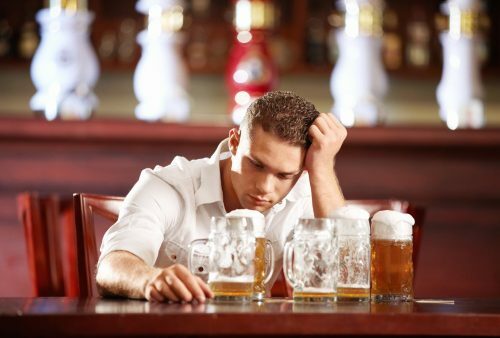 Drinking heavily may cause irreparable damage to your liver and your health, therefore, adhering to the guidelines set by the Centers for Disease Control and Prevention, recommending a maximum of two drinks a day for men and one drink a day for women, is the best prevention strategy.